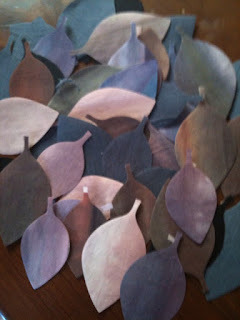 I have been playing with the leaves I got from Lisa Thanks Lisa for creating the fusibles - I think they are great. I sewed some onto a created background - then I thought they needed a fine layer of stuff just like you might see them in the bush. The top thread has a slight tinge of daylight sneaking through. However I rather like the back. We are rather over summer - this weather has been going on for too long. At least in Melbourne they get days off. 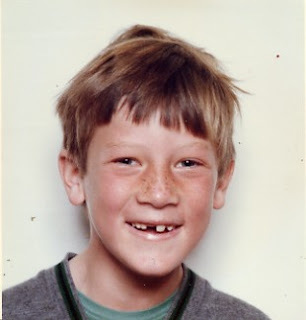 Happy Birthday Bruce - and all of 38 today - hope you have a wonderful day - you could frolic in the snow you lucky thing. to this.... - same smile we reckon..... freckles all gone? 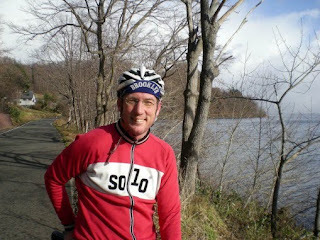 and what's more - we have found the bike you need for your trip from south to north in Japan. 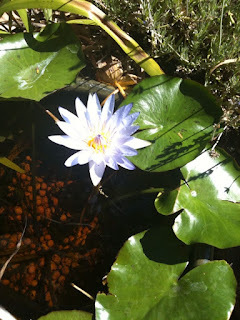 Happy Australia Day from my beautiful tropical waterlily which just keeps on keeping on. 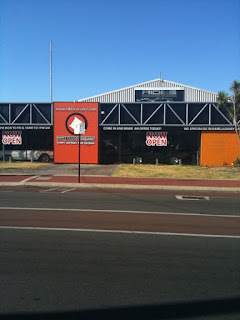 Well - we spent the first half of Australia Day at our warehouse (you didn't know we had a warehouse?) It's just around the corner in Bulwer Street and since we have been making decisions (read about it in the February newsletter - not really ominous Robin), organising the warehouse has been one of them. Ian bought a pile of new shelves and we have set the back area up as it should be and I found all manner of things I had forgotten we had. Quite exciting and soon we should be able to move a lot of our spare stock from our home to the warehouse (good word). The 'shop' will still be here of course - people come here almost every day and are always welcome if we are here to greet them - that will never change. If you don't get our newsletter you can sign up on our website - we have excellent specials for our special newsletter readers - some good stuff coming up in February as well. 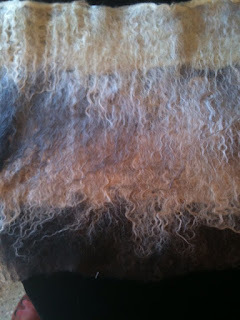 This is my beautiful Stonehaven slushy dry felted - I love the way the silk has waved its way around. 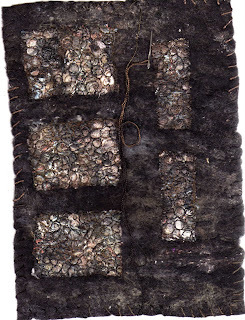 I was going to hand stitch but it is very delicate and I think I will work it on my embellisher. 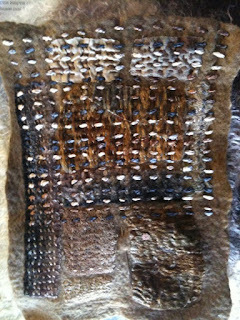 It really does look very delicate but it is quite strong as a fabric. I am working on new embellisher ideas in readiness for a next stage embellisher class - something about hot needles, cool stitches or vice versa. That and my gilding the lily should be ready in a month or two for on-line excitement. 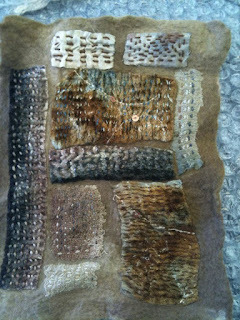 I have spent the weekend at a felt and surface stitch workshop with Leanne Davis - extremely hot but gave me some new ideas to play with and it probably is good for me to sit and work away. 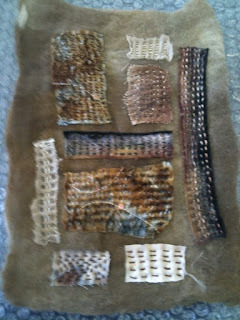 We made wet and dry felt and believe it or not I plodded on with my Stonehaven theme. After I made my felt I stitched onto it every different type of fabric I had in my box and stitched with every different type of thread to see what happened. Then I felted it again and finally I am adding some running stitch to link. I also dry felted up a slushie which turned out rather yummy. The best news of the day was that SLAM won today's heat in the Australian Champs in Sydney - well done Grant! 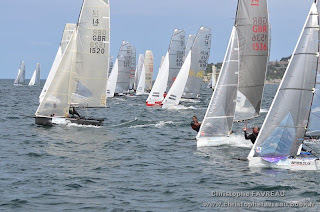 First West Australian 18ft skiff to win a championship race. While the weather is still respectable we can enjoy the mornings - sweeping the garden area - loads of leaves and little branches as there is a cyclone up north so it is pretty windy. 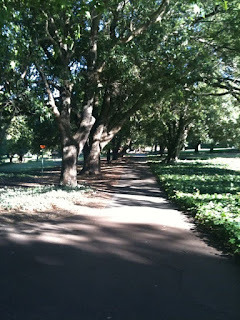 i changed my walk this morning - this is Forest Park - there are lots of parks around our area and I guess all over Perth - watered with bore water and green unlike the parks in Melbourne. they play cricket and soccer here and probably other sports and on the 43 degree day I saw a cricket game in action. 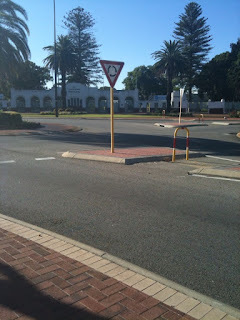 I know you all think only mad dogs and Englishmen go out in the midday sun - well add mad Aussies as well. 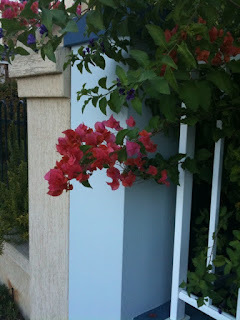 I passed a bourgainvillea on my walk - there are lots of small climbing roses out mostly white I noticed. We have been making decisions this month and think we have finally concluded our discussions. Lots of work to do though - I shall update when we are ready. The cooler air sure does revive one. I have been packaging the slushies in tubes - the colours are like sweets in a lolly shop - being the bad photographer that I am, I just use my i-phone. 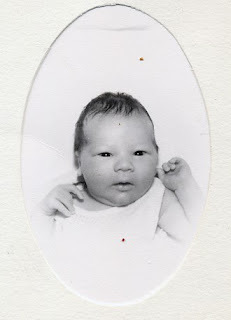 Ian does point out that the real camera takes much crisper better photos but you know me. Anyway you just have to imagine that they are even better in the real than in my pics. 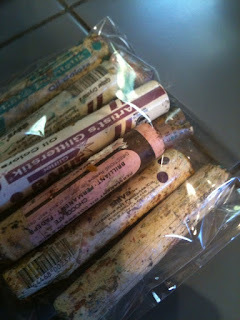 I feel something royal shiraz coming on as the colours in the tube look so glorious. Up at 5am to a lovely cool change and happy birds outside chirping away. 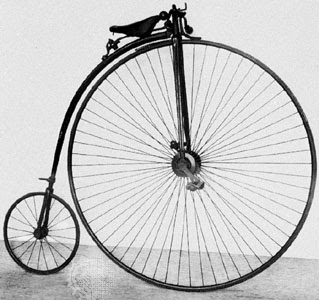 Off for a pleasant walk in the park. 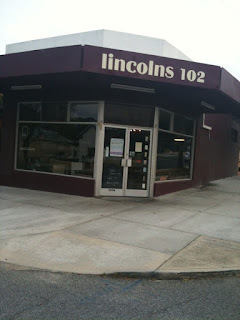 This is Lincolns Cafe just around the corner beofre it opens - it's a fabulous place for coffee and Julie's yummy food. The giveaways have all gone - all the mail came in this morning - 5 people all at once so I am making another pack of stiks and will contact those first 5 since they were like a race - crossing the line together. 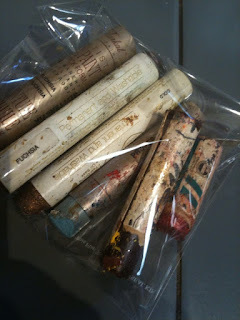 Thanks very much - I will have more goodies to give away before too long as I work my way around my studio. Looking inside Lincolns before it opens - a lovely dull morning and you see all the reflections from the window. it has been exceptionally hot this week - loads of temperatures over 41 and record overnight and record no rain. 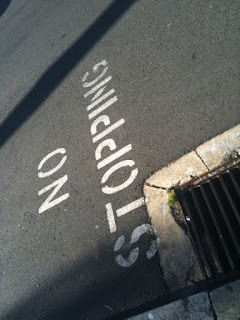 Means we have been working slowly - it certainly is draining and while we have air con we don't like it. 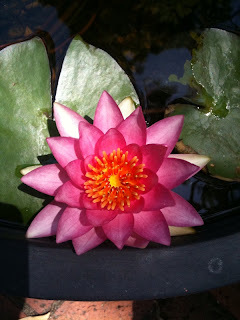 one of the waterlilies has badgered on and kept flowering even though its leaves have looked rather burnt up. Resilient they are. Anyway it is finally nice tonight and we could sit outside and enjoy the sea breeze. To top it all off, the web was down and the emails are finally filtering in after many hours of nothing. All the books have gone and I have a few more giveaways - 3 packets of shiva stiks - certainly not new - I am cleaning up - but each bag contains professionals, iridescents and glitters. 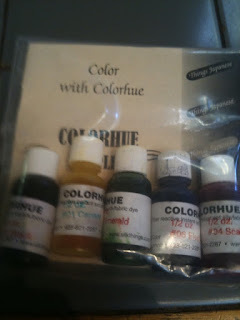 Plus a packet of Colourhue dyes hardly used. Just email me - first in best dressed. Same applies - the cost of a red Aussie Post bag. It's 43 out there in the open air which is the same as the walk from the house to the studio. Too hot to even get in the car and drive to the river for a swim because we will be just as hot when we get back again. My poor garden is not happy - the herbs are all shrivelled up and I have been spraying them with water. The purple waterlily is very happy though with 2 more flowers emerging down in the depths of the pot. It is doing best out of all three. Ian is working away loading new goodies onto the website because at least he is sitting under the air con vent and with his new computer and Windows 7 , he is as happy as Larry. I have been putting together our own Shiva Stik combos - colours which appeal to me (I have just finished writing an article for a new textile magazine and have been playing with them) and burning away layers and getting ready to work with the wonderful leaves which Lisa sent me. She has leaves, stars, feathers and hearts - they go by the name of Fusibles - that is they come with fusible webbing already on the back and all you have to do is to peel it off and bond them to whatever surface you are working on. When I saw them I thought they would be a nice addition to my stone department so I am planning a Stonehaven page using some of them. 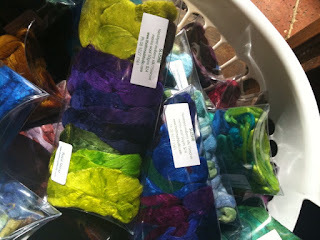 They are lovely because Lisa uses her own hand dyed fabrics and the colours will add a dimension for me. 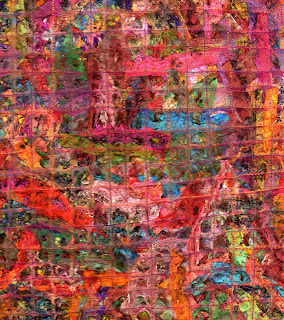 Just working out what background I am going to work on first. I am cleaning up some more and have a number of books to give away - free but with the cost of postage. In Australia, that means a red bag with Australia Post. My morning walk is pretty predictable - I usually go around Hyde Park and sometimes deviate to wander different streets - Ian is more adventurous. When the school holidays have finished I shall go swimming again but the thought of thousands of kids having classes etc puts me of for the moment. Shall stick to a swim in the river instead. It is going to be hot all weekend and beyond so indoors stuff I think. 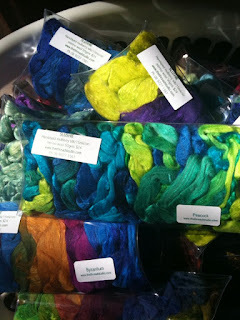 I got a lovely parcel of goodies this week and want to get working on them. The proof copy of let's play with the Flower Stitcher came yesterday - very pleased with it - hopefully we will have them soon and be able to send out all the ones on pre-order. you can see where the water has dried up - it's an ongoing saga - there are people who think the council should do something about getting water back into the lakes - have they heard of global warming? you can see lots of algae in the water - I think the council are sort of retoring it to the swamp land it was - around our area of Perth there were many swamps and there are quite a number of housing spots built on swamp land where there have been problems. If the water table sinks then you woul dexpect the houses might too. They don't call the state sandgroper country for nothing. 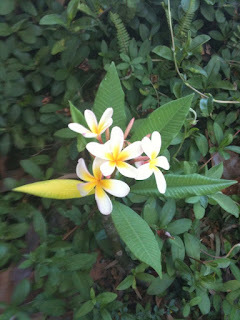 Things on my walk this morning not far from home. We have a laneway just across the road from us - there are loads of laneways all around Highgate and in Menora where we used to live - this one feeds the flats over the road and the back of all of the houses along there. 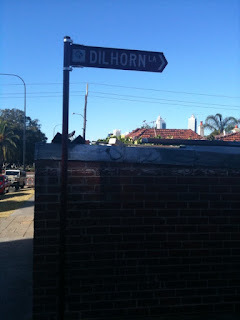 Suddenly on Saturday, a town of Vincent council man came along and popped up a name for the laneway - Dilhorn Lane - amazing. Shame he didn't think to pop up a new Smith Street one on the corner which disappeared some time ago. Just around the corner - a place selling retro cars - old Mustangs etc. Haven't seen such a collection for a long time. Our Perth Oval (aka ME stadium) where all the concerts and soccer are held and this year - yeah - the home for rugby - just how close is that? Back over the road - this is what people do here with things they don't like - dump them on the verge - I am happy to say that these mattresses started on our lawn and Ian dragged them back down the lane so they have appeared again but over the road this time. 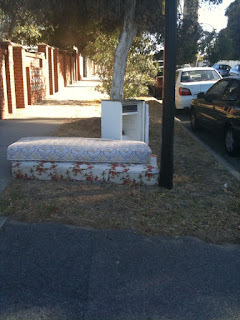 The trouble is as soon as someone dumps junk it encourages everyone else to add to it. Hardly enticing. What have we been up to today? Well, the weather is not as hot as it has been - we went for a walk and checked out Grant's decking which is looking very good, had a chat to his elderly neighbour who can't speak English and we can't speak Italian so that was interesting. 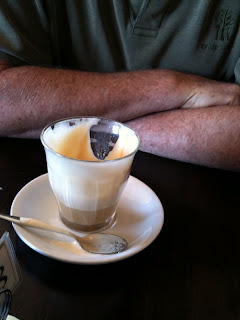 Then we had breakfast at Source, the ecco cafe. Rest of day we have pottered around - practising with the video and the flower stitcher. When the book is ready for sale, we will have some short videos on the flower stitcher on the website. 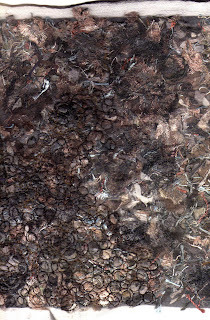 I have been playing with glues and gilding flakes and acetate and stencils and sprays so there are plenty of flakes floating about the studio along with Starburst Spray bottles and glue and stuff. I am glad the park and relaxing on the bench has been cheering - I think some of our heat has marched on to Melbourne but don't worry - we have more to come. but our Highgate in Perth one - Ian took this on his morning walk today - it's for all the people up to their knees in snow. 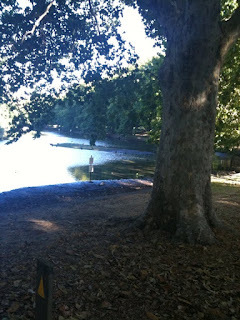 It's a very European park but the lakes are invariably dry in summer these days. 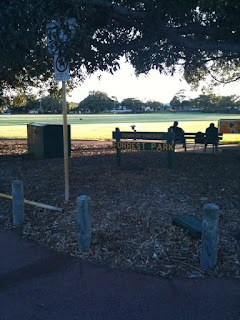 lots of people walk around it in the mornings, families enjoy picnics and bbqs and many people like to sit on the chairs or the grass and relax. It is about an 8 minute walk from our house. 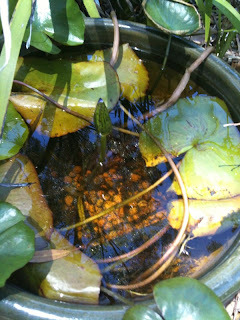 I can't resist popping in and out to see how my new waterlilies are going. I love them - I could live in he corner of Monet's waterlily garden without any trouble. I don't think I can find space for more than 3 here though. The flowers seem to last about 3 days but I keep inspecting to make sure there are more coming up - not sure if one should be fossicking around inside the pot all the time but I can't resist it. The one at the top is the hardy one - this is a new flower which opened up this morning but there is another down under water. The one below is the tropical one - the lovely light purple - it has had 5 flowers all gone but here is a new one peeping up through the water which I am sure will open up tomorrow. I am afraid the original one (over 17 years old) has got rather upset with the 3 pills I gave it and looks burnt on the leaves but Lois thought today that was obviously a female plant with plenty of stamina and hanging on for grim life. 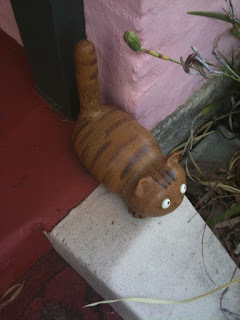 I have been talking nicely to it in a quiet voice. Today we finished the flower stitcher book and it is off to the printer - I had to leave out some photos and of course the minute you see it all in print you think of other ideas you could have added. Never mind - they will make it to the web instead. Also - I had a list of people who preordered it and i think I have lost part of the list so if you did, you might like to email and remind me - I am not usually so vague about things. Must have the excitement of getting to the end. 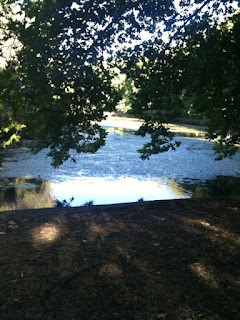 Deja vue - we went to the river again last night for a bbq - looks like we sit and look at the same stuff doesn't it? There were the usual ducks and seagulls everywhere and then 6 black swans came floating up the river and made their way to visit everyone - they looked rather regal and one tried very hard to eat our tablecloth - it was too dark by then to photgraph them but they were amusing to watch in action. And finally a pelican swam by so it was a busy night. 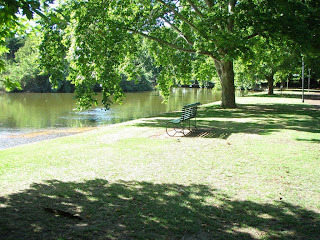 Where we go is a lovely peaceful spot by the river. And no - this isn't Perth - well not Perth in WA - Viv sent it to me - it is amazing how it can be hot and sunny in one place and full on snow in another and we can all communicate so easily. Thanks Viv - it helped cool me down. It's not so bad today. 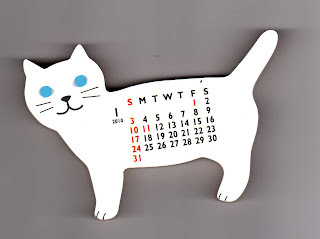 our Christmas parcel from Kazuko and Bruce arrived today and one of my goodies was a clever cat calendar. Here is January - I have it up in my studio keeping guard of the bears, Kazuko. 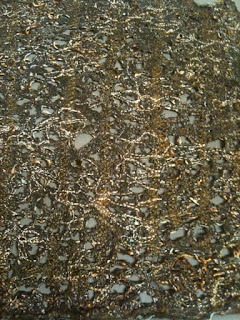 I am working on my stones as always at present - they help to keep me cool maybe. 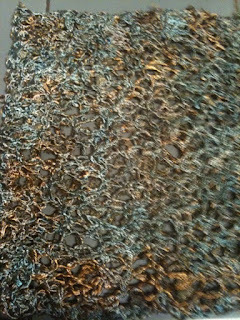 Yesterday's piece was finished stitching and then I cut it up but apart from the edge, I can't decide how to link it all up. If you are after some good books, we have loaded our January book sale onto the website. there are some good books and some very good prices. I am trying to create space for new ones. just imagine how nice it would be to be sitting on river stones by an icy fresh stream - yes it is still hot - think our bbq tonight will be abandoned once again. it's very hot here today again and we had to abandon the chicken tandoor on the bbq - there was a fire ban until 7pm and Ian didn't fancy lighting up in the heat so we went to the river where it was so windy but warm. Back home it is still windy and very warm. You wouldn't want a fire roaming around. It is going to be hot tomorrow I do believe. and Holey Moley Lesson 4 should be ready tomorrow - working a bit at half pace with the heat I think. 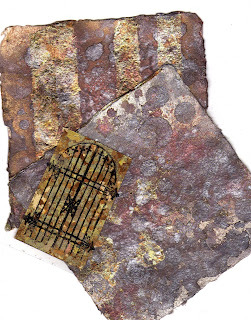 I am going to run a shorter Gilding workshop because so many people ask me if I will and I was playing with a new idea this afternoon when I should have been stitching my holey moley lice - I ran a needle through my finger and it broke in half but came out cleanly and doesn/t even hurt. 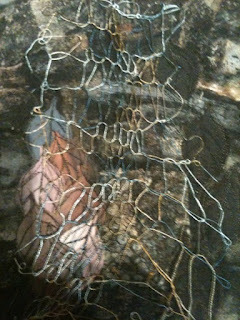 I am also working on an Embellish Stitch Enrich some more as these new ideas will keep coming to me. Off to have a glass of cold water and my green tea. It's been very hot today and still very hot at 7pm so too hot to cook the next lot of tandoori chicken on the bbq and we are off out to eat. 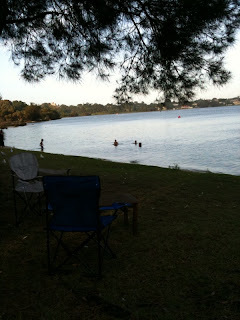 This afternoon after doing all the CPS to send out tomorrow, we went down to the Swan River for a swim - lovely. 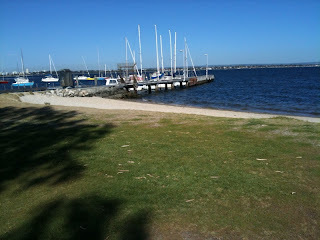 We went to Nedlands yacht club - it was incredibly quiet on the river so all the regattas must be elsewhere in Australia. 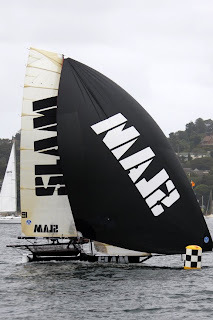 Grant is sailing in the 14ft Internationals off Manly Yacht Club - if you are in Sydney and see 14s, he might be one of them. I haven't been able to find any pics as yet. 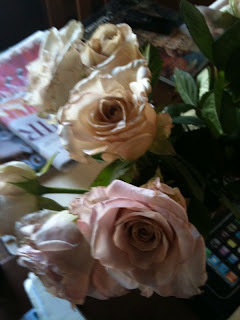 my latest roses - can never resist them. The waterlilies in their transfer shock are recovering but new flowers should be out tomorrow - the others have pretty well done. All that excitement of moving homes. 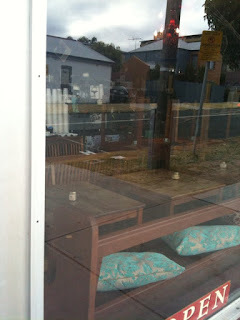 Lisa - I like popping into Beyond the Monkey as well - shall take a pic next time. 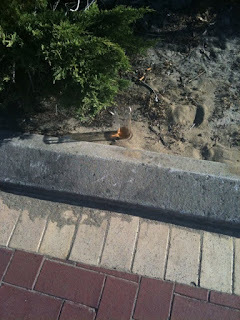 Heard today that there was a stabbing down on our corner New YEar's Eve - we missed that!